A candidate for mayor of Winnipeg questioned whether a recent trip Brian Bowman made to Colorado — to attend a memorial for fallen firefighters in North America — was paid for by the Winnipeg firefighters union and if Bowman is in the pocket of union interests. A candidate for mayor of Winnipeg questioned whether a recent trip made by incumbent Brian Bowman — to attend a memorial for fallen firefighters — was paid for by the Winnipeg firefighters union and asked whether Bowman is in the pocket of union interests. 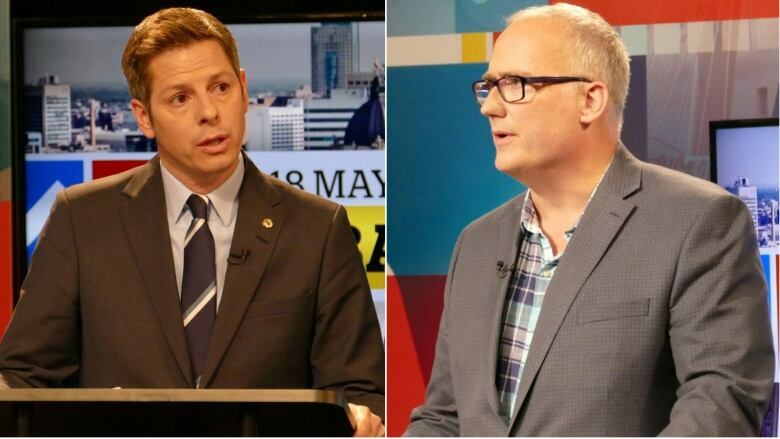 During the CBC mayoral debate on Thursday, Tim Diack referred to a past statement of Bowman's wherein he criticized a time when special interest groups and union leaders allegedly called the shots at city hall, then launched into his question. "In September, you attended a two-day event in Colorado Springs, Colorado, held by the International Association of Fire Fighters. Who paid for that trip?" Diack asked Bowman, referring to the 2018 Fallen Fire Fighter Memorial. "It would have been resources out of my office that would have paid it," Bowman said. "I was pleased to attend. That was a ceremony that occurs every year in Colorado Springs out of respect for the fallen." A spokesman for the mayor's office said the city paid for all of the mayor's travel, including a hotel room, which was part of a block reservation made by the United Fire Fighters of Winnipeg. Communications director Jonathan Hildebrand provided a receipt to the CBC showing Bowman paid for the room. Hildebrand said the only expense that may have been covered by the union was a buffet dinner provided to Bowman and others at the memorial. Alex Forrest, president of UFFW, said Thursday his union did not pay for Bowman's trip. Forrest said if any costs were covered, the union may have paid for service costs or meal costs that included the family of the fallen firefighter. The Manitoban honoured in Colorado Springs in September was Jack Nicol, who died of occupational cancer as a result of exposure on the job, said Forrest. "For any politician to be using this as a type of political mudslinging is absolutely ridiculous," he said. Bowman's trip to Colorado does not appear in his expense report, Diack said after the debate. The candidate, who is a Winnipeg police officer, called it "poor leadership" on Bowman's part to "talk to the firefighters" in Colorado and not the police association. "He hasn't talked to us since 2014. So no, he has not paid the same respect," said Diack. "I just think he's burned a bridge and he can't communicate well." Jenny Motkaluk, the candidate polls suggest has the best chance to unseat Bowman, passed on an opportunity Thursday to question the incumbent head-on. As part of the CBC forum, candidates could ask another candidate of their choosing a direct question. 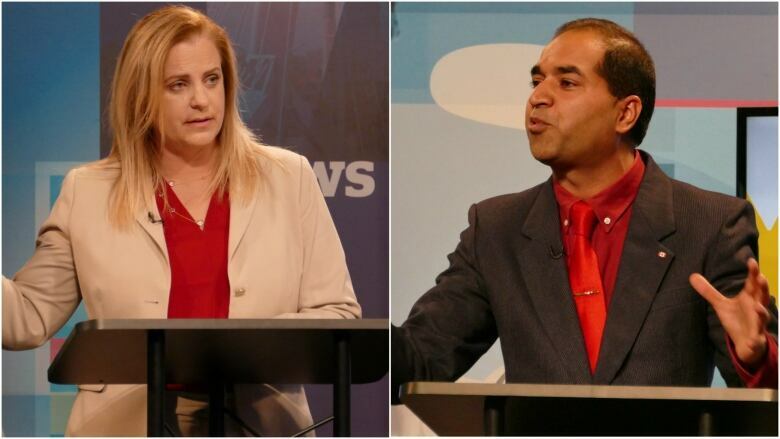 Instead of grilling Bowman, she asked Umar Hayat — a candidate who a recent poll commissioned by the Winnipeg Free Press and CTV suggests has one per cent of the vote — what was the first thing he would do if elected mayor. "My decision today was to not provide Brian Bowman with one extra second of air time in front of the voters of Winnipeg," Motkaluk said after the debate. The format chosen by CBC, allowing all eight candidates time to speak, meant she was unable to get into a fulsome discussion, one-on-one with Bowman, said Motkaluk. Hayat responded to Motkaluk's question, saying he would review Winnipeg's financial statements. Candidates also shared ideas on public transportation and the way Winnipeg handles sewage treatment. In a year when transit fares jumped 25 cents to $2.95 a ride, Ed Ackerman called for Winnipeg to make public transit free and allow citizens to build tiny homes near the rail lines. Don Woodstock, a former Winnipeg Transit driver, said he would reduce fares to $2 and then eventually make fares free to make buses safer. "You eliminate the fares and you don't have the problems," he said. Umar Hayat said the city can't afford to make fares free. Later in the debate, candidates challenged Bowman on Winnipeg's handling of wastewater. "I think it's absolutely horrifying that in 2018 we still dump raw sewage into our rivers with alarming regularity," said Motkaluk. She is promising to add back-up generators to sewage lift stations which, she said, will eliminate a third of all unintended outflows. "You don't denigrate the name of our great city," Bowman said in his rebuttal. Winnipeg has invested millions in modernizing the sewer system to replace combined sewers that hold both storm water and raw sewage, which reduces seepage into the natural waterways, said Bowman. Last year Manitoba Sustainable Development gave the city until 2045 to capture 85 per cent of the diluted sewage that flows into city rivers during an average year. Wastewater engineers estimate it will cost Winnipeg $4 billion to eliminate all combined-sewer overflows. With the legalization of marijuana set for Oct. 17, the candidates were asked for their opinions on pot and whether they plan to use the drug once it becomes legal. Bowman said he hasn't' smoked pot and has no plans to try it once it's legal. He said his primary concern around legalization is the possible increase in costs to the city for public safety measures. Motkaluk countered Bowman's worries over cost, saying the cost of policing illegal pot was already a burden on the taxpayer. She said she sees legalization as a "great opportunity to potentially generate some revenue" and "make sure we get the illegal drugs out of the hands of the people who shouldn't have it." Diack said he worries legalization will mean users may be more likely to drive while high but sees a potential for police to raise additional funds once pot is legal. "What I like is that there are high fines," he said. "We'll be able actually to recoup quite a bit of our enforcement costs by issuing tickets to people who are dumb enough to smoke it in their vehicle." Wilson said his late wife used marijuana while living with leukemia. "I am not against this happening," he said. "We will not see mass terror in the city." Ackerman said he thinks the federal government should reissue the $1 bill, instead making it with hemp and marijuana. "So it can be rolled up and smoked," he said. "That would be fantastic for foreign exchange, so there you go." QUESTION 1: Should we put put bike infrastructure on the back burner in our car city? QUESTION 2: After completing construction that has already started on the Southwest Transitway, should we scrap the rest of rapid transit? QUESTION 3: Is it time for a major reinvestment in fixing up our aging recreation centres? QUESTION 4: Should we reopen Portage and Main to pedestrians?